Lithuania is a great place to visit. I have been there a number of times while visiting the Baltics at the end of a work trip to Russia. I was working with a USAID project doing repair work in a hospital in Sankt-Peterburg. 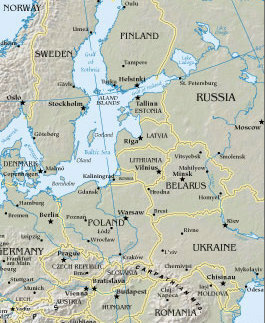 I would get to Russia by flying from Chicago to Helsinki, taking one of the many ferries across the Gulf of Finland to Tallinn, Estonia, and then continuing after a few days on an overnight train to Sankt-Peterburg. US Government map of Lithuania. Wandering back from Russia, on most trips I traveled south to Latvia and Lithuania before returning home via Tallinn and Helsinki. 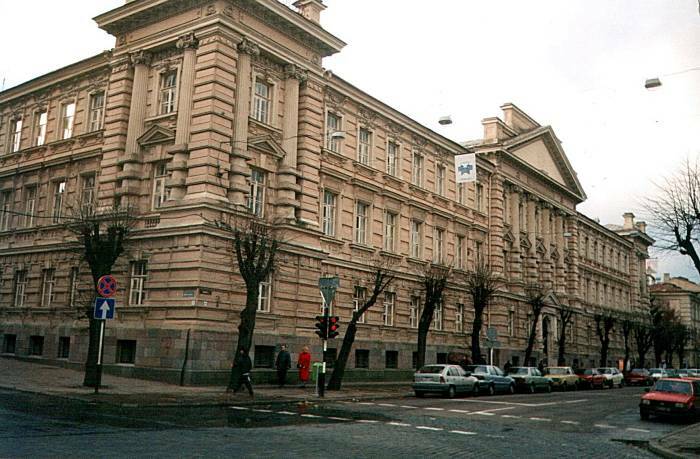 Something you must see in Vilnius is the Museum to the Genocide of the Lithuanian People, commonly called the KGB Museum and housed in the former KGB prison and torture chambers. It's in the basement of this building. The Soviets brutally occupied Lithuania between 1940 and 1991. There were 242 slave labor and extermination camps in which Lithuanians were held (and many more where non-Lithuanians were held). 135,000 Baltic citizens were killed or shipped to the death camps in 1940-1941, plus another 435,000 in 1945-1949. 300,000 Lithuanians were sent to the slave labor and extermination camps, where most died. In comparison, the Nazis exterminated "only" 200,000 Lithuanian Jews during their brief occupation. You also have to keep reminding yourself that the torture chambers you see were in full operation through 1991. Some of the few surviving ex-inmates give the tours. 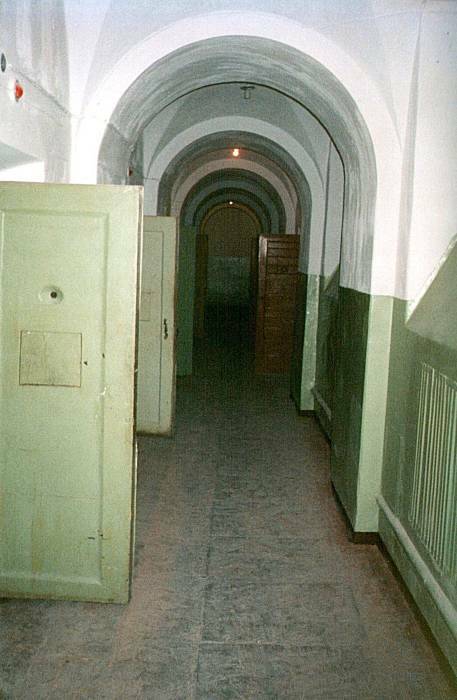 Above are views of one of the hallways, and one of the cells. 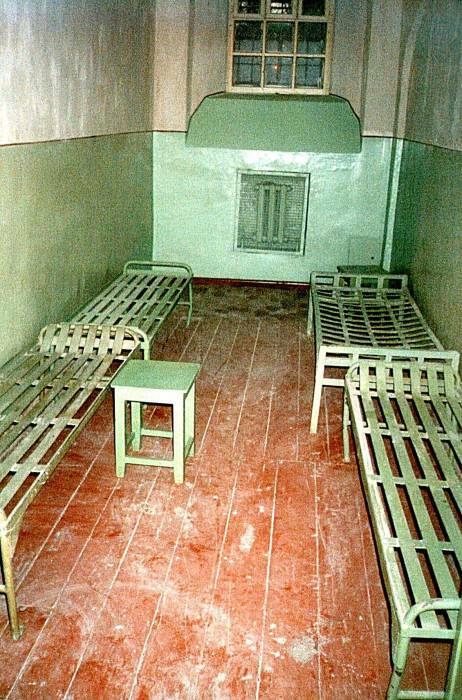 Below is one of the torture cells. Notice the metal disk on a post toward the rear wall. 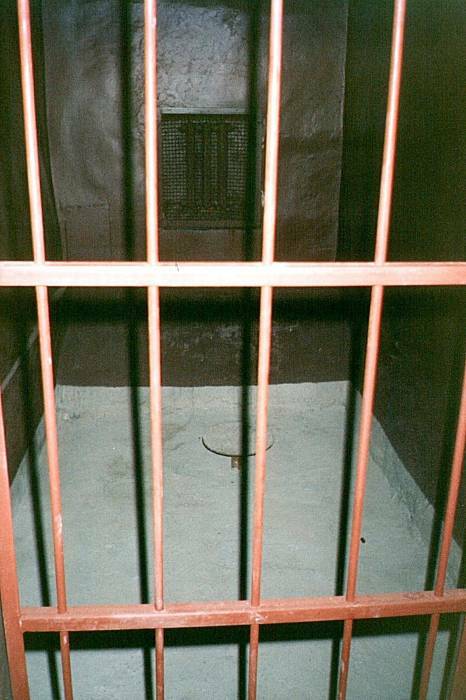 The floor of the cell is about a foot below the floor of the hallway. The cell, basically a very shallow tank, would be filled with icy-cold water to the level shown by the light grey paint — so that the top of the metal disk was just barely above (or maybe slightly below) the water level. The prisoner would be stripped naked and locked in the cell. The cell could be refrigerated, or in winter, simply ventelated to the outside (and if the air temperature in the cell were far enough below freezing for the water to freeze, salt could be added to the water to lower its freezing point). As long as the prisoner could stay awake and balance on the small disk, they probably wouldn't freeze to death. Time in the cell combined sleep deprivation with extreme cold. The guy who took me through on a tour had spent time in one of these cells. Straitjackets like this one were used not only for transport but for long-term immobilization. It was too dark to get a decent picture, but there was also the padded cell with the blood stains on the padding. 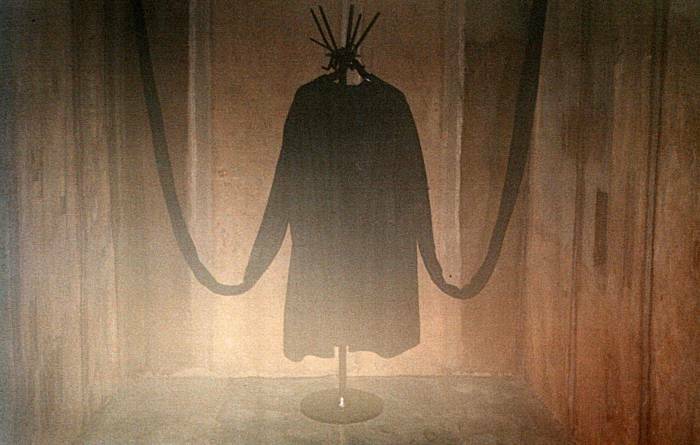 This is one of the creepiest places I have ever been, along with the death camps run by Germany in World War II. But it's definitely a place to visit, to understand history. There are trains between Vilnius, Lithuania, and Tallin, Estonia, stopping in Riga, Latvia. From Vilnius there are buses and trains to other Lithuanian destinations. The main bus station is just a block from the train station. There has been train service between Sankt-Peterburg and Vilnius, but I don't know if it's still running. It was a hassle, because it was an overnight train with two border crossings — Russia to Latvia, then Latvia to Lithuania. Don't plan on restful sleep. Kaunas is a nice place, either as a destination for a few days or a day trip out of Vilnius. There are also connections between Vilnius and Poland. Bus travel around the country is pretty easy. The train crossing either Belarus or Russia (the disconnected Kaliningrad Oblast) requiring a transit visa. I think they got that straightened out, either by using a new rail line that crossed the Polish-Lithuanian border, or by negotiating a sealed train that crossed those other territories without stopping. When I was there, Ritos Sleptuves was a nice place for dinner. It's down along the river just east of the center of town. You could then hang out after dinner at the NATO Bar in the center of the old town, complete with both LAAWS and RPG-7 launchers hanging on the wall. Transport around the city is good, if you know where you are going and where the bus lines go (and how to get tickets for the bus)! 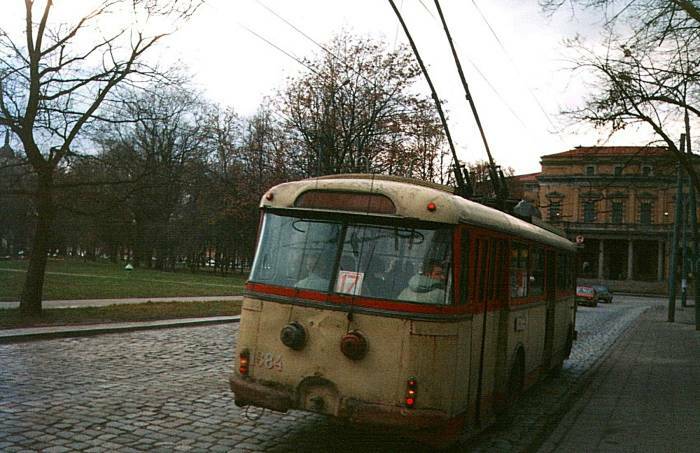 Here is one of the electrically powered buses in Vilnius. But I covered a lot of territory on foot in Vilnius. There weren't any hostels when I was going to Russia for the hospital project. There weren't many foreigner tourists in Lithuania then! 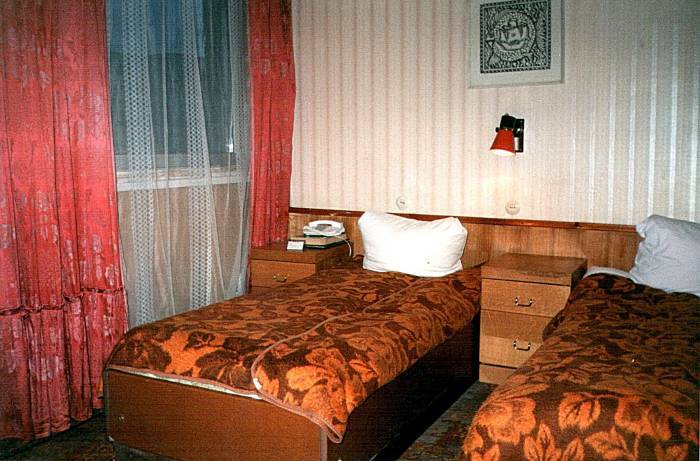 One option then was an unrenovated (meaning "Soviet") room at the Hotel Nauja Vilnius, which was about US$ 30 a night. Here is one of the rooms, it was pretty nice. It's across the river from the city center, next to the art museum. Head left (west) on Kaunas past the hideous crumbling Greco-Soviet temple with the giant hook protruding from the front facade. Continue a few hundred meters on Kaunas, then turn right (north) on Sitrigailos, where there's a large yellow building on the far left corner of the intersection. Continue a few hundred meters on Sitrigailos, then turn left (west) on Vivulskio, where you pass a PTT office with a large tower holding an array of microwave antennas, an easy-to-spot landmark. Go down past the PTT to #36, a tall building set back off the left side of the street.